El Nino's are weather conditions which recur in a somewhat regular 5 to 10 year cycle. It is predicted that this fall we will experience "firsthand" El Nino conditions. The last several weeks we have witnessed exceptionally high tides, with mounds of driftwood and debris being left ashore. Alexander von Humboldt, an early European scientist to visit South America, observed a cold ocean current flowing from south to north, which was named after him. The Humboldt current follows South America's Pacific coastline northward as far as the equator causing very low precipitation (low evaporation due to cool water) and creating the deserts in northern Chile, Peru, and southern Ecuador. Bahia de Caraquez, located on a peninsula just south of the equator, has little precipitation and enjoys the moderating ocean breezes directly caused by the Humboldt current. At the equator it turns due west sweeping past the Galapagos Islands into the central Pacific Ocean. North of the equator the warm Panama current flows in the opposite direction. This warm current brings warm moist air and high levels of precipitation to the Pacific coasts of Panama, Columbia, and northern Ecuador. The relative strength of these two currents, which differ in temperature by 8 to 10 degrees varys with the seasons. The warmer current strengthens in the winter months and dominates and pushes it moisture farther south. Such heavy rains in normal desert like areas are the El Nino phenomenon. Trade winds from the far east also blow west . As these change they create drought like conditions in Southeast Asia & Australia, by bringing the rainfall to the coast of South America. The ocean level rises causing marejadas or exceptionally high tides, which can destroy beaches and seaside property. The occurrences of extreme tide levels result in the ferry docking right at the edge of the pavement, beachside property having 12 to 18 inches of sand lowered and removed in one fell sweep of the ocean, significant amounts of driftwood and debris being collected and redeposited elsewhere, and floating dock ramps now past level horizontal and approaching an incline! The two most recent El Ninos took place in 1992-1993 & 1997-1998 which were both devastating for the coast of Ecuador. 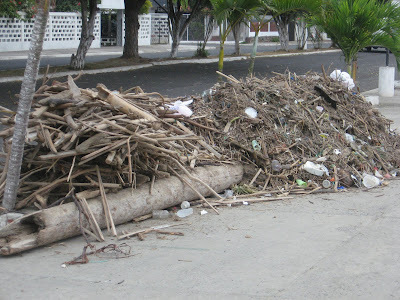 Bahia de Caraquez significantly suffered in 1997- 1998 with significant mudslides, silt and debris deposits in the mouth of the river, and major road closures for months, and suffered major damage from the earthquakes. Colombia and Ecuador will face each other again on Saturday, September 5th as qualification to reach South Africa 2010 resumes all over the world! There are only four matches left for each team in the campaign. Columbia is only 3 points behind Ecuador for the last qualifying position so it could prove a very strong contest. Brazil faces Argentina on the same afternoon.